When GlutaMAX and SkinWhite's controversial skin-whitening campaigns made their rounds on the Internet, people were angry for different reasons. Some of that anger was directed at creatives, specifically the teams behind the problematic campaigns. Some of the comments read: "Who thought of this?! ", "Fire your marketing team", "'Eto ba yung trabaho ng mga mukhang pera?" People often forget that sometimes, it doesn't matter how ~creative~ you are, the client always wins. So Cosmopolitan picked the brains of some of the creatives we know to find out what they think about skin-whitening campaigns. For director Antoinette Jadaone, it's all about the freedom of choice. As a visual person, she explained it simply with a diagram! 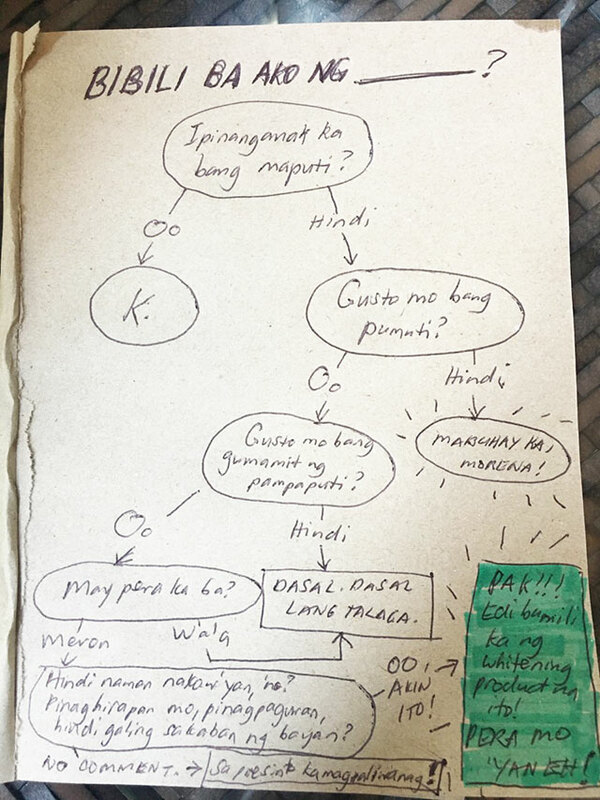 We're loving how straightforward and foolproof her explanation is: It all boils down to, "Gusto mo bang pumuti?" Makeup artist Albert Kurniawan is also all about consent: "Some people really think getting whiter means being one step closer to becoming more beautiful or attractive. But for me, skin color's never been an issue. A lot of people want to be whiter but are afraid of using products because the side effects might be too strong or too dangerous. As long as you get the ones that are BFAD- or FDA-approved, you will be fine. And whitening products don't just make your skin lighter, they also make it brighter and clearer. There's no shame in this, especially if it means it'll boost your confidence." Lala Flores mirrored these sentiments: "As a makeup artist professionally working for 20 years, I've been blessed to have worked with countless beautiful [people who are] confident in their own skin. So it's never been an issue to me whether you are [light] or dark, as long as you have radiant skin. We can always find beauty in each of us that we can all be proud of and [celebrate]." For photographer Sara Black, what matters most is positivity. "I think what people really want nowadays is skin luminosity, not necessarily whitening. A product with a brand philosophy that's deeply embedded with positive affirmations, combining the positive affirmations with the effectivity of the product to create physical radiance in the skin. Radiance from within and without." 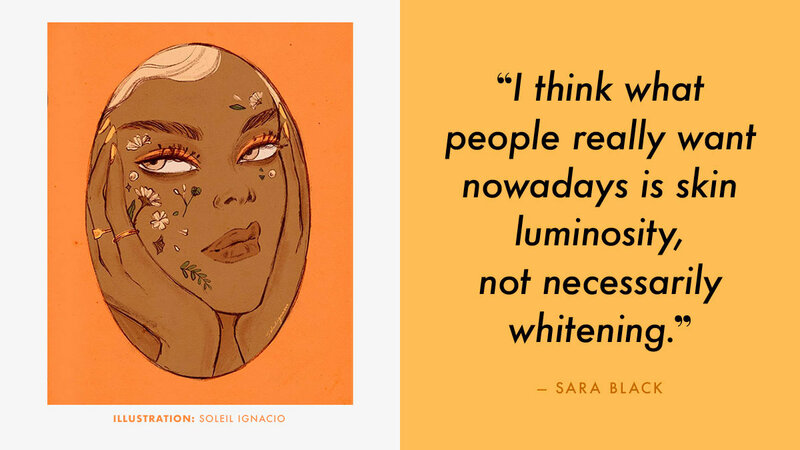 Artist Soleil Ignacio echoes, "I think the only way a skin-whitening company can be truly body positive is to realign their values and to offer more range of products for different skin types. Maybe have something for morenas/morenos too to keep our sun-kissed skin glowing, like a fresh-from-the-beach look all year round! And instead of whitening, I think promoting skin brightening would be something all of us could benefit from." For more of Soleil Ignacio's artwork, visit her Instagram and website!